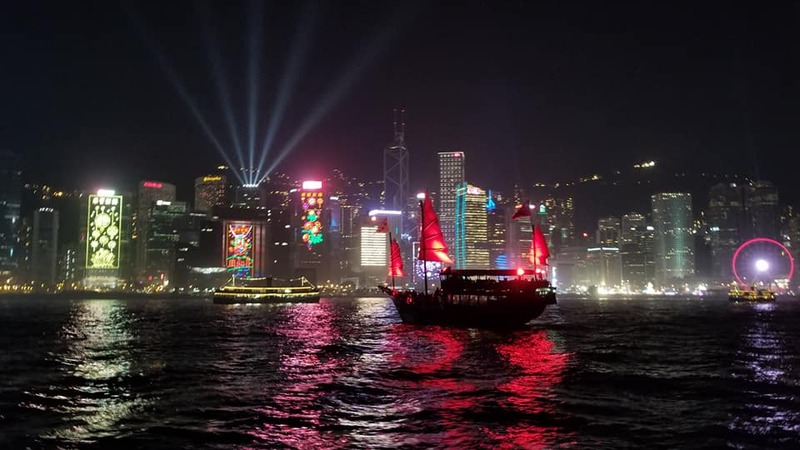 Hong Kong has many wonderful qualities, but it is not a user-friendly place to outsiders. It's crowded, bustling, and ever-changing. That yummy dim sum restaurant you adored might be gone and replaced with a fried chicken joint in a matter of months. That mural you admired on your daily commute has suddenly been painted over and replaced with new artwork. It's hard to keep up! And there's a lot of things one learns through trial and error because it isn't made apparent if you're new to the big city. Hong Kong doesn't have the time to teach a newcomer how to swim in a sea of 7 million people, all crammed together on what my friend Lucas calls "the least relaxed tropical island in the world." For an American like me raised in the mountains of Pennsylvania, the first few months living here was incredibly overwhelming just in terms of figuring out how life works here. Having lived in HK for over a year now, I've realized it is a very small world despite encountering people from all walks of life on a regular basis. You learn the areas where you live, people at businesses you frequent begin to recognize you, and you slowly forge together your own close-knit little community. To quote the song "Twilight World" by Swing Out Sister, "Forget lonely crowds, unfriendly faces, they'll soon become familiar places, before too long..."
For those of you looking to visit or live in Hong Kong, I've compiled this list of helpful how-tos that can make your stay, long or short, more convenient and fun in a shorter period of time. Long-term residents: get your Hong Kong ID Card. If you plan on living here for any amount of time, this is an absolute must. You'll need this to open a bank account, set up utilities, get a local cellphone plan, and pretty much anything else major that you can think of. You also will need it to go in and out of Hong Kong when you travel since it also works as your customs card. It is quite handy because rather than filling out a form and standing in line, you just run the card through the security gate, place your thumbprint on the pad when prompted, and you are good to go. The ID card is free of charge and the immigration office will issue you a temporary one that is effective immediately - the real one can either be mailed to you at a small fee or you can opt to pick it up - it usually takes about two weeks to process. You can find out all the details on where to get one here. Hong Kong is a hiker's dream. 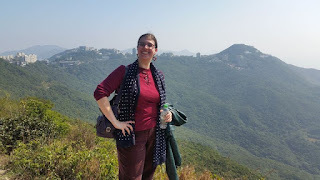 Your favorite Critic at the top of Victoria Peak trail. When I first thought of this area, the existence of incredible, scenic hiking trails did not immediately spring to mind. But they are there! Hong Kong's geography is wonderfully varied - you get the best of the mountains along with the best of the ocean. When the humidity isn't 200 percent, there are many great trails to be explored and a deep, abiding love for nature lies at the heart of HK culture, despite the bustling metropolis side of it all. Check out Sassy Hong Kong's Guide to the best hikes here. This one of the biggest learning curves for me coming to Hong Kong. In the US, cash has slowly been replaced with credit/debit card options in almost every situation, from fast food joints to self-checkout kiosks in Wal-Mart. Octopus cards can be refilled at convenience stores as well as MTR stations. I didn't learn this until about three months into living in Hong Kong. You can go to your neighborhood 7-Eleven or Circle K, hand them your cash, tap the Octopus sign near the checkout and hey presto - its been refilled. This is so much better than having to walk back to the MTR every single time, and it's definitely a perk not well advertised. Prepare yourself for expensive, tiny apartments. The "tiny house" trend in the US got nothing on apartments in Honkers. Prepare to spend at least US$2,000 a month on a place that will probably be around 500 to 600 square feet total. As Americans, we tend to like our space, so this definitely came as a bit of a shock to me. The good news is, Hong Kong is a very transient place, so there's always plenty of choices in terms of places to live. Do your research and find a good local realtor that will take the time to show you around, preferably someone that can be vouched for by a friend or trusted source. Many employers offer tax breaks and housing allowances to employees since the ridiculousness of the housing market is well-known, so if you are employed by a local company, talk to your HR representative. Again, you probably have to ask since perks like this don't tend to be well-advertised. This will come in handy since often you have to pay upfront at least two or three months' worth of rent to the landlord prior to signing the lease. Getting a personal bank account here as an American is a pain. Local banks are not here to help you. In fact, they actively do not want your business. Cashing US checks here? Forget about it. However, especially if you have a job in Hong Kong, you need to have an account since most employers do not want to issue live checks (and good luck cashing them without an active account here). You get paid by direct deposit, once a month, in one lump sum - then it's up to you not to blow it all before your next paycheck the following month. Believe me, direct deposit is the way to go anyway since the bank is usually incredibly crowded and you want to avoid going there in person as much as possible. My husband and I went with Hang Seng Bank, which is a cousin to HSBC Bank based in the US. This means we can take money out from HSBC as well as Hang Seng Bank ATMs all over Hong Kong with no fee involved. They are also more open to connecting overseas US accounts, which I have to maintain to pay off my US credit cards since connecting a Hong Kong bank account up to a universal payment service such as PayPal is a no-go. Standard Chartered Bank, for instance, one of the oldest banks in Hong Kong, will not issue accounts to American expats, full stop. Things that you will need for sure to open a bank account here: your Hong Kong ID Card, a hard copy letter from your employer - signed and stamped - that verifies your employment and monthly salary, your passport and working visa, and two pieces of actual mail from a utility company or a bank that verifies your address here in Hong Kong. Those are the basics, but be sure to ask a bank representative exactly what else they may need - it never hurts to be overprepared here. Again, it may take up to two weeks for everything to get sorted out; so make sure you have plenty of cash on your Octopus or in your wallet to fall back on in the meantime! Utility bills can be paid at the ATM. Talk about handy! Websites for bills such as electricity and water can be pretty incomprehensible and don't always have English translations - and online payment really isn't a thing here for most services. The good news is, once you get the bill in your mailbox you can pay via the ATM - it is right there on the menu options. Just be sure to have the bill with you in order to type in the account number and the bill payment amount. You can also do direct cash payments via the ATM. Need to pay someone in advance for an event or party they are organizing? No need to wait until you see them - another perk of the ATMs here is as long as you have the person's account number and the bank they use, you can deposit cash right into their account. For instance, if there's a party going on and the organizer needs HK$200 ahead of time to reserve the table at the restaurant, if they tell me they have an account with the Bank of China, I can head over to that ATM, choose the cash deposit option, plug in the account number they give me, insert the cash, grab the receipt - all done! Movie theatres require reserved seating ahead of time. Yup, you read that right. You want a seat in the movie, you have to book it ahead of time, preferably on the movie theatre website. The upside is that you know you'll get the view that you want - the downside is that people use it as an excuse to get to a movie late since they know their seat is guaranteed. Oh well, at least we can all still eat popcorn during the show! US Passport Holders who have been to mainland China previously are eligible for a 10-year multipass visa. The proximity to the number of amazing places from Hong Kong is pretty extraordinary; the closest being mainland China - however, as an American while you don't need a visa to travel to Japan or Taiwan, you DO need a visa to go to "the mainland" as Hong Kongers call it. The good news is for around US$250, you get unlimited visits to anywhere in the mainland for 10 years. If your passport expires at any point during that decade, the visa can be transferred over to the new passport. This is an incentive that is only available at this point to US passport holders who have previously traveled to China and had a temporary visa once before. Get packages delivered to your workplace. Package delivery can be a tricky thing here in Hong Kong; especially if both you and your spouse work out of the home. Most delivery people are on a tight schedule, so if you're not there - back to the post office it goes, and it's up to you to go retrieve it. Ain't no second chances for you. What is infinitely less stressful is to have packages delivered straight to your workplace (if your boss allows it) where someone in reception will be sure to receive it during business hours. So you get the package you want and you don't have to worry about figuring out which post office it landed in. Pick up some basic conversational Cantonese. I was happy to find that the language barrier is pretty minimal here - most everyone speaks some basic level of English. But knowing a few phrases in Cantonese can be very helpful from time to time. For instance, many cab drivers do not speak English, as well as people that install your utilities or fix issues within your apartment. You're still gonna be a gweilo (meaning foreigner) no matter what, but knowing some basics can up your street cred a little more and smooth the way for better transactions in the future. Cabs are not very helpful and quite expensive - use the bus or the MTR. Cabs in Hong Kong can be the worst. They are very expensive, CASH ONLY, and often they will use any excuse not to take you where you want to go - especially if you are clearly not local. On the plus side, Hong Kong has one of the easiest, cleanest, cheapest and most efficient transportation systems in the world with the MTR, which accepts Octopus cards as payment - tap and go, zip zip. I strongly suggest giving the train map, trolleys and bus routes a look before trying to hail a cab. Eating or drinking on MTR buses, trains, and trolleys is not allowed. For my fellow NYCers reading this, you're probably gasping at the prospect of not being able to carry your morning coffee on your commute. I have found that if I am carrying water and not making a huge deal of it, I can sneak by with that - I call it the "gweilo pass". But food is an absolute no-go and it will be taken away from you (I've seen it happen). On the upside, the trains and the stations are some of the cleanest I have ever seen, so I think it is worth the sacrifice not to snack! 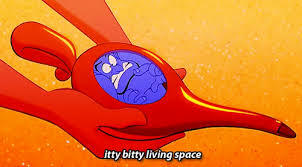 When I first moved here, I had no job or family to rely on and only knew a total of two people that lived here (aside from my husband). Before I got my full-time job here I had my freelance audiobook editing work to tide me over, but working from home can be a very isolating experience. I knew I had to go out and meet people. I went on Google and found out about a group called InterNations - a kind of Facebook for expats. The Albatross membership, which only costs about $10.95 per month to join, allows you to make friends, join social groups and activities as well as official InterNations social and networking events at a fraction of the cost it would normally be to attend fancy dinners, clubs and events (have I mentioned Hong Kong is expensive??!) Many of my close friends that I have made here were made through InterNations, and they have opened many doors for me. Other groups I can recommend are the HK chapter of Meetup.com as well as the Expat Hong Kong Facebook group that not only features ads for apartments and needful things but offers an open forum to ask pretty much any question and about Hong Kong and share information with other fellow expats. 1. Watch out for highly aggressive train and elevator doors. 2. Always hand cash to people with both hands. 3. Most apartments do not have heat. Invest in space heaters because it does get cold from time to time! 4. Things like dryers, dishwashers, conventional ovens and sometimes even fridges don't always come standard in apartments. Do you have any helpful tips for living, working and traveling in Hong Kong? If so, add your comments below!